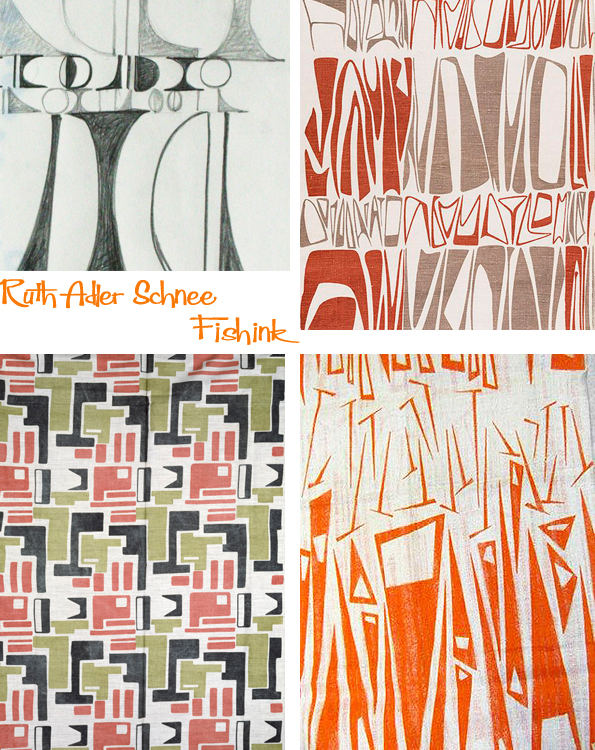 Born Ruth Adler in 1923, her passion for art started very early. Her parents loved art, music and design and instilled that same passion in her. As a child she played with mobiles on the floor of family friend artist Paul Klee’s studio and drew detailed interiors as a pastime in her childhood home in Düsseldorf, Germany. In 1942, when Ruth left Detroit to attend RISD (Rhode Island School of Design), she took an overnight train on the New York-bound Wolverine line. On her train schedule, a warning alerted passengers to delays from trains carrying war materials or troops, which had the right of way. She understood those warnings more than most. Born in Germany, she and her family had fled the Nazi regime in 1938. She was not yet a naturalized American, nor was she a German: In 1935, Hitler had stripped all Jews of citizenship. “I was a nobody,” Ruth told her daughter in a 2002 interview. They may have lost almost everything material, but the family held on to its love of art as they settled in Detroit. “We came to Detroit without a job or money, and before looking for a job my parents took us to the Detroit art institute,” she said. That love and talent won her a full four-year scholarship to the Rhode Island School of Design. After a stint in New York she returned to Michigan on a one-year fellowship to attend Cranbrook Academy of Art in Bloomfield Hills and became the first woman to earn a graduate degree in architecture. She decided to go into business and opened a storefront on 12th Street in Detroit. There she displayed and sold a small selection of furniture and wares by such esteemed modernists as George Nelson, Warren Platner and Frank Lloyd Wright, all major architects and designers of mid-century modernism. When she married Edward Schnee, a graduate of the Yale School of Economics, they moved to a larger space on Puritan Street and officially launched the Adler-Schnee store. It was one of the first stores in the United States to sell modern furniture, fabrics and home furnishings to the public – everything from cooking utensils to unique art objects. After a fire at the store, they moved the store to Livernois Avenue. It was not initially successful. People in those days preferred the mass market styles sold in department stores. “We just couldn’t earn a living in the early days,” she says, “but I was inspired by art and nature. It’s a simple thing, but true.” She was mixing in artistic circles, and as a young mother of three, her circle of friends and collaborators included Charles and Ray Eames, Frank Lloyd Wright, Buckminster Fuller and Minoru Yamasaki. Slowly but surely things got better. The artistic objects sold at Adler-Schnee began to show up in kitchens and living rooms across metro Detroit and across the nation and her work became well known. From living rooms, fitting rooms and hospital rooms to museums, showrooms and skyscrapers, her textiles began to appear in the most intimate and the most iconic settings. She worked on the General Motors Technical Center in Warren (1950-55), on the World Trade Center (1970-77), and on the update of Albert Kahn’s Ford Rotunda in Dearborn (1952-53). 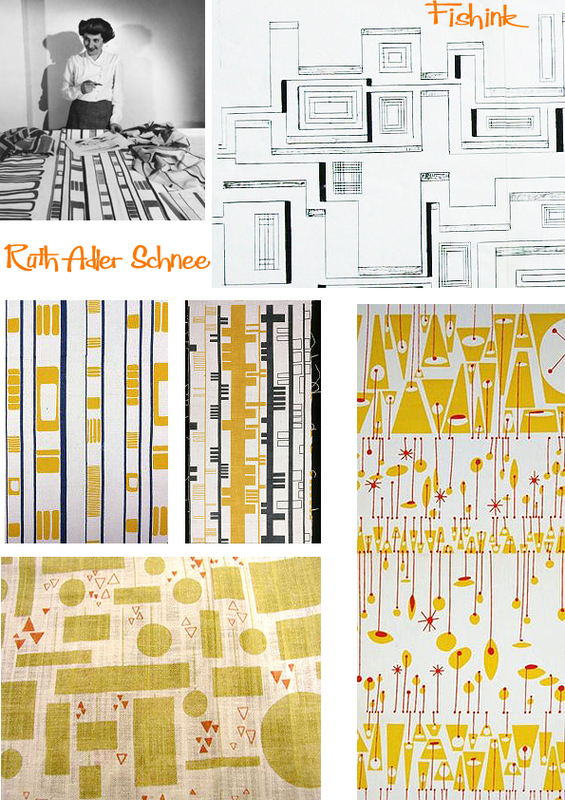 Ruth’s work also included projects that reflected her experience as a woman in an almost exclusively male industry: While pregnant with one of her children, she designed interiors for the former Feld-Weisberg Clinic, a contemporary building named for her obstetrician at the time. “I had the idea of using whimsical figures on the ceiling, because I had to be lying on . . . those tables for the examinations, and I felt that one should have something fun to look at while one is being examined,” she says in her oral history. “As an immigrant who launched an influential business in Detroit, as a woman who broke through barriers in a male-dominated field, as a Detroiter who helped shape an international sensibility, her story speaks to the value of inclusiveness, to the entrepreneurial spirit and to the profound role the arts play in nurturing our souls,” says Rip Rapson, Kresge president and chief executive officer. 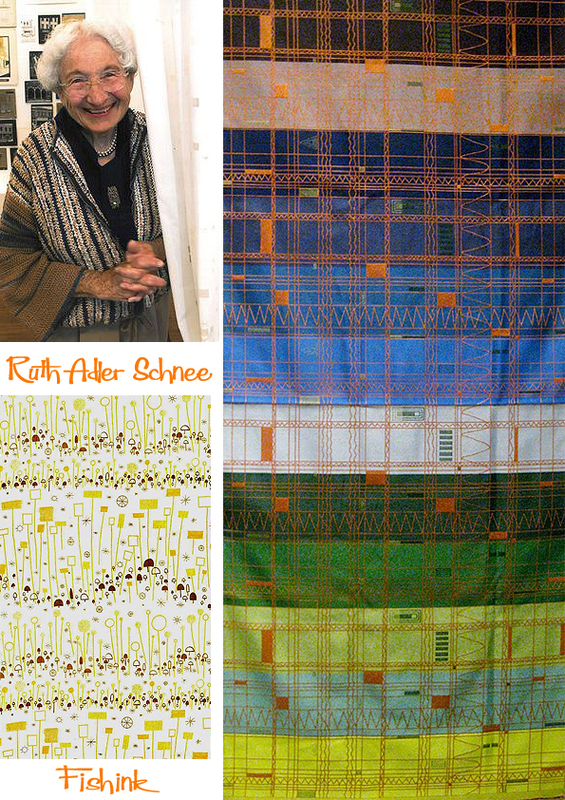 Two years ago, at 91, she was selected as the 2015 Kresge Eminent Artist. Many thanks to the information from Marge Sorge over at The Detroit Hub, which has made this post possible. Thanks for that wonderful bio. There are so many women who have contributed their artistic skills to making every day life more beautiful. 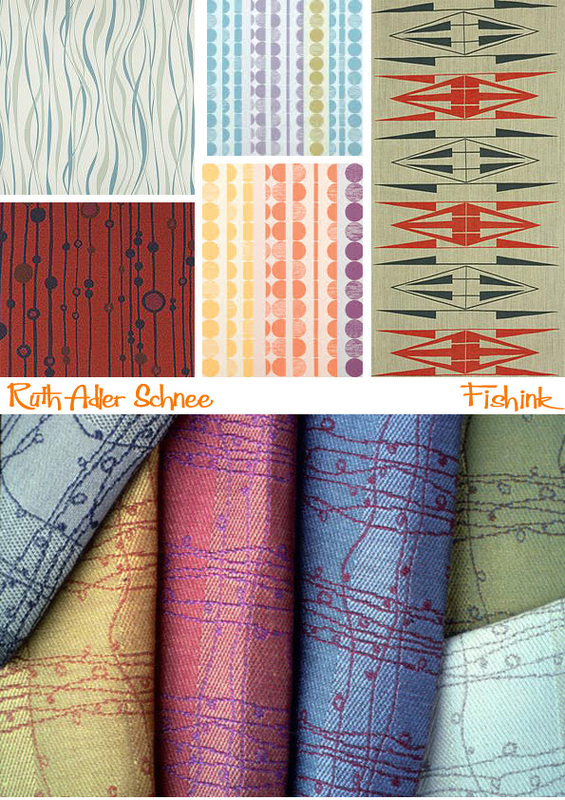 Design and textile crafts are art forms that need more recognition. 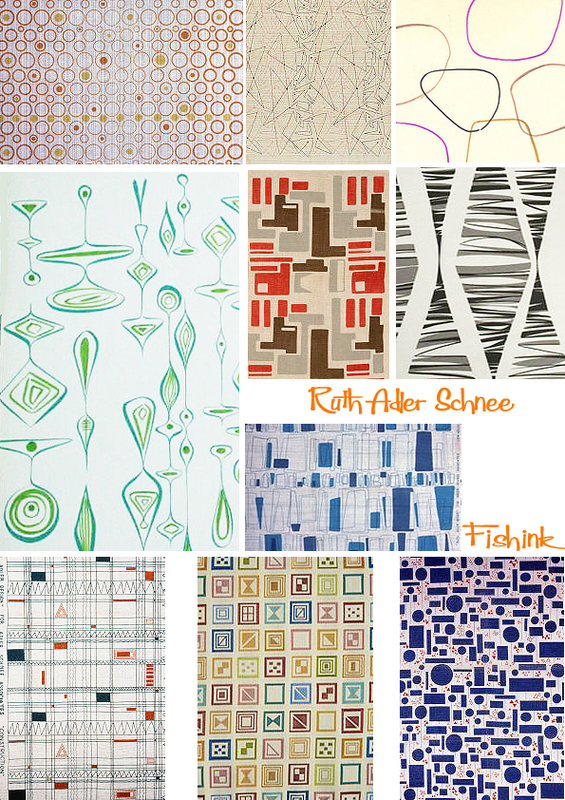 Wonderful collection and truly inspiring that she is still designing at 93.